I have a shed and a deck that has needed a new coat of paint for a couple of years, but I never wanted to get out my brush and roller to paint them. I decided that I wanted to get a paint sprayer, but with so many options out there, it was hard to narrow down the different models. After spending a lot of time researching, I finally found the perfect paint sprayer to complete my projects. I bought the Graco Magnum X5 Airless Paint Sprayer after reading some great reviews and looking at the specifications of the product. I realized that it was exactly what I needed to complete my projects, and after using it a couple of times already, I can confirm that it was a great investment. “You can see a few of the resources that I used to decide that this was the best paint sprayer for me at the end of this article “. After spending hours reviewing the information, I decided to order it. I’ve used it a couple times already and couldn’t wait to get online to share my positive experiences with you ! The first project that I took on with this paint sprayer was painting my 12’x20’ shop. I was amazed at how quickly I was able to complete the project! It took me less than an hour to finish it, and I think it looks just as good as if I paid a professional to do it. The adjustable pressure control was a key feature that I really liked while painting my shop. At a spray rate of .27 gallons per minute, I was able to get through a five-gallon bucket of paint quickly without any problems. And as easy as it was to use, it was even easier to clean when I got finished! The maximum tip size of this paint sprayer is .015 ( which is a little smaller than some other models Graco Magnum X7) . It is also lighter than most other paint sprayers that I looked at, weighing in at just under 20lbs. It’s designed so you can easily carry it around if you have a larger project that you’re working on. But with a 25’ hose included, you shouldn’t have to move it around much when you’re painting. In order to get the most out of this paint sprayer, you should read the instruction manual before using it. There are some good tips and tricks in there to make your painting experience a good one. For example, you should only use certain types of stains and paints, and you should not use any solvent-based lacquers, block fillers, texture-filled materials or asphalt. Not only will you not be satisfied with the performance, but you could also ruin your sprayer. The PushPrime feature is way underrated, in my opinion. It’s extremely easy to prime and I have never encountered any problems with pressure or priming. As a result, your paint spraying job could go very quickly, so make sure you have your entire area prepped so you won’t have to take many breaks. For people that like to do occasional DIY projects around the house, I would highly recommend purchasing the Graco Magnum X5 Airless Paint Sprayer. When compared to other paint sprayers of a similar quality, this one is generally cheaper than the others, so you won’t find a better value anywhere. Sometimes the worst part of painting is the mess that you will make. While you will still make a mess due to the nature of the work, the Graco Magnum X5 Airless Paint Sprayer is very easy to clean. All you have to do is connect a water hose to the sprayer and you can easily clean the entire unit in no time. And the best part about it is that there is very little maintenance that you have to keep up with as long as you clean it thoroughly after each use. I wouldn’t say that this would be the best paint sprayer for painting large jobs, like the exterior of a house, but it’s perfect for the DIY’er that wants to paint things like their shed, fence, deck, patio and other smaller structures. It’s designed to be able to spray up to 125 gallons per year, which should be plenty for occasional use. The one thing that I had trouble with when using this sprayer was losing suction when the paint in my bucket got a little low. Once it got down to about a gallon left, it had a hard time keeping suction, which slowed down my productivity. What I did when the paint got low was just pour it into a larger bucket and continued painting. It’s a little inconvenient to do it that way, but at least you won’t be wasting paint. You could also keep that gallon or so of paint for touching up in small areas that you may not have been able to coat thoroughly. A similar paint sprayer that I looked at was the Graco Magnum Project Painter Plus. It has a slightly slower delivery rate at .24 gallons per minute, but it works just as efficiently. It is also lighter in weight at just 15lbs, so it’s great for someone who can’t lift that much and needs a lightweight sprayer. However, the reason I didn’t buy that paint sprayer is because it didn’t seem like it was made for larger projects. 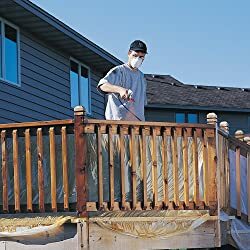 It is great for painting doors, small patios and decks and some fences, but for painting shops and other larger exterior projects, it didn’t seem like it would hold up very well. 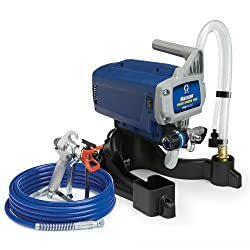 I definitely considered buying it, but since I had a few larger projects that I needed to complete, I felt like it was better to spend a little more money and buy the Graco Magnum 262800 X5 Stand Airless Paint Sprayer. 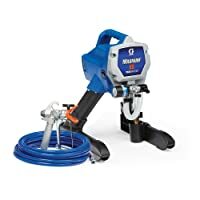 For people that like to do occasional DIY projects around the house, I would highly recommend purchasing the Graco Magnum X5 Stand Airless Paint Sprayer. When compared to other paint sprayers of a similar quality, this one is generally cheaper than the others, so you won’t find a better value anywhere. It can be a little addicting when you use the paint sprayer, so just be aware that you will probably want to complete more projects once you get started! The average homeowner would love having this airless paint sprayer in their home, so don’t waste another minute and order yours today! I have used it three times now. Works great! Sooo fast. Make sure you have plenty of paint though, if you run out and have to clean machine a lot of time will be wasted.